The weekend of the 6th August I took part in the MIRA Sprint at Nuneaton a round of our Hillclimb and Sprint Championship. Because of work and domestic pressures, this was in fact the first event in our championship I have been able to take part in this year. This is the first season in which Competitors have been competing under our new rule system. This new system is designed to encourage more people who wish to have a go to come join the championship as all class structures have been removed and one competes against a personal bogey time at each event where the bogey time is calculated by the championship organisers, based on information provided by the competitor about their car and their experience/ability. Whilst it's early days, we hope this new format will encourage many new competitors in the coming years. Natalie joined me at MIRA and after a good day out she expressed a continued interest in taking part. As Natalie and Marcus are both now beyond 21 they are intent on getting a National B licence for next year and double driving with me on a few events beginning 2012. 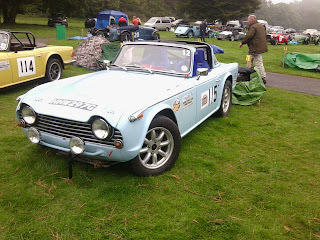 My next Hillclimb and Sprint Championship event was the MG Wiscombe on 10th September. This is always a great day out in an absolutely fabulous setting in Devon. I have been competing at Wiscombe since the late 70s and had hit a brick wall on best time. The hill for me is one of the nicest hillclimbs not just for the setting but because there is an open section across pasture land, followed by a twisty section under tree cover after having passed through a pair of gate posts. If there is any rain at all the section under the trees stays damp whilst the area in the open quickly dries, making it a difficult venue to do well at. 20 years ago to the day I had set my best time of 51.08 seconds when Matthew Short and I came joint first in class with exactly the same time, he in his TR6 and me in my TR2. Several years ago I managed 51.09 in my TR5 and have been constantly irritated over the years by not being able to beat 51.08 even when driving quicker machinery such as my TR5 and with the benefit of more modern tyres. However Saturday 10th September was a glory day for me at Wiscombe in the TR5 as I managed to get under 51 seconds even though it rained during the day and the track was decidedly wet under the trees. To say I was well pleased would be an understatement! My next outing assuming my entry is accepted will be the Pegasus Sprint at Castle Combe on October 15th, it would be great to see some spectators there if you have a free weekend. 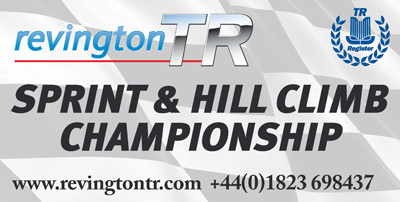 Castle Combe is our last event after which we will know who has won the championship this year. You can of course follow the championship by going to the TR Register Competion pages or like the facebook page.